Your project can achieve significant benefits by using AIR O MATIC MULTI VRF SYSTEMS. Efficiency and modern modular design are just the beginning. The modular design of AIR O MATIC MULTI VRF SYSTEMS results in greater energy savings giving users the choice to air condition or heat only the zones being used. A VRF system provides incomparable dehumidification and temperature control by rapidly and efficiently adapting to loads. The AIR O MATIC MULTI VRF SYSTEMS removes losses that are unavoidable in other systems without using larger duct systems. The Multi VRF systems also contains optimized scroll or rotary compressors, specially designed heat exchangers, and inverter technology, which reduces energy consumption to levels previously impossible by non-VRF systems. The modular design offers comfort on demand permitting the choice to use the system only in the zones where it is needed further promoting reduced energy consumption. You can see the energy efficiency and performance AIR O MATIC MULTI VRF SYSTEMS offer with our latest software program. The software precisely models energy consumption based on the buildings features such as design, orientation, location, and other design conditions taking into account your specific utility rate structure. With the use of inverters and dual compressor outdoor units, the AIR O MATIC MULTI VRF SYSTEMS offers superior load matching, preventing constant cycling or large temperature changes. Tight temperature control through precise load matching guarantees maximum comfort, proficient operation, and superior dehumidification. The modular design of VRF results in greater energy savings giving users the choice to air condition or heat only the zones in use. The AIR O MATIC VRF offers individual zoning to insure every user’s maximum comfort. 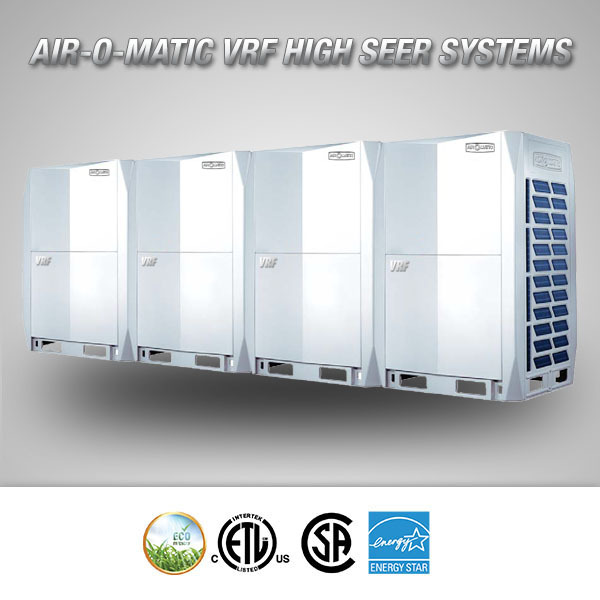 The AIR O MATIC variable refrigerant flow air conditioning systems are engineered for sustainable green buildings. AIR O MATIC MULTI VRF SYSTEMS indoor units are offered in a wide range of styles suitable for any interior design. We offer ducted units that hide completely concealed in the ceiling, indoor unit choices with cassettes that mount flush to the ceiling, and mirror finished wall mounted units that fit into any décor, the AIR O MATIC MULTI VRF SYSTEMS offers incomparable aesthetic design. One of the amazing qualities offered by the new AIR O MATIC MULTI VRF SYSTEMS is the ability to be virtually noise proof. Work without distraction. Sleep without noise. With indoor units that can operate at sound levels as low as 23 dB (A) and outdoor units that operate as low as 50dB (A) and lower with night quiet operation, our VRF systems creates a comfortable environment so quiet it’s almost undetectable. For additional sound level control, a night quiet mode can be set to limit fan speed during off peak hours. Available for a wide variety of settings such as office, education lodging, healthcare, multi-family structures, dining and retail. Related to: Mitsubishi Vrf Air Conditioning systems, Daikin Vrf Air Conditioning systems, Hitachi Vrf Air Conditioning systems, Samsung Vrf Air Conditioning systems, Lg Vrf Air Conditioning systems. Variable refrigerant flow (VRF) is an HVAC technology invented in Japan by Daikin company in 1982. Like ductless minisplits VRFs use refrigerant as the cooling and heating medium. This refrigerant is conditioned by a single outdoor condensing unit, and is circulated within the building to multiple fan-coil units (FCUs). VRFs are typically installed with an Air conditioner inverter which adds an DC inverter to the compressor in order to support variable motor speed and thus variable refrigerant flow rather than simply on/off operation. By operating at varying speeds, VRF units work only at the needed rate allowing for substantial energy savings at partial-load conditions. Heat recovery VRF technology allows individual indoor units to heat or cool as required, while the compressor load benefits from the internal heat recovery. Energy savings of up to 55% are predicted over comparable unitary equipment. This also results in greater control of the building’s interior temperature by the building’s occupants. VRFs come in two system format, two pipe and three pipe systems. In a 2 pipe system all of the zones must either be all in cooling or all in heating. A three pipe Heat Recovery (HR) systems has the ability to simultaneously heat certain zones while cooling others. In this case the heat extracted from zones requiring cooling is put to use in the zones requiring heating. This is made possible because the heating unit is functioning as a condenser, providing sub-cooled liquid back into the line that is being used for cooling. While the 3 pipe system has a greater initial cost, it allows for better zoned thermal control of a building and overall greater efficiencies.